10.2% Minnesotan family of 4 live under $25,000 per year among them 12.7 are children under 18. 17.5 million Households in America, approximately one in seven, face food insecurities. About 896 million people in developing countries live on $1.90 a day or less. One: Donate! (Time, Knowledge and Resources). Offer matching for donations or ask your company or club to match or donate. Buy my “Book Mark For Help and/or school bags for $15-30 each bag and adopt my Christmas bag for children in need. Participate in SHFC projects like Christmas bags, food, coats, diaper drives, Hope for the holiday, and more. Review “Causes” section on my website for details or email me your questions. Tell 5 or more people inside and outside your friend circle a story of how my work has impacted local and global communities. Invite me to speak to churches, schools, clubs, and events about community empowerment, youth service engagement and many youth service related topics. The impact and reach of networking is far beyond the local communities; experience it by spreading the word of my work to friends, neighbors, or colleagues from inside and outside your school, business, church, and more or to show them the power of one is something they can be proud of, participate in, and donate to. “Helping a child means transforming a community one life at a time”. 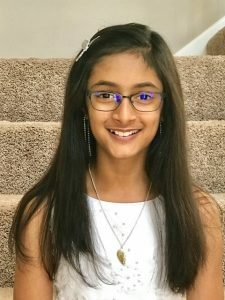 About us: Sanya’s Hope For Children is nonprofit organization which was founded in January 2017 by Sanya Pirani, 6th Grader. Sanya has been engaged in community service work since she was 7 year old. Sanya received multiple award related to community service. In 2016 she received a national award from AFP (Minnesota association of philanthropy) “Exceptional youth in Philanthropic” and “Leadership Service award” from CAP (community action partnership) agency.